Ullrich Aluminium Ltd operate a gravity casting foundry at their manufacturing operation in Dunedin. Major alloys cast are AA185B for use in Anodes and LM6 for general die casting. A range of anode sizes for corrosion protection on sea going vessels are available from 1.5kg through to 12 kgs in aluminium alloy. Zinc anodes can also be cast to customer's requirements. 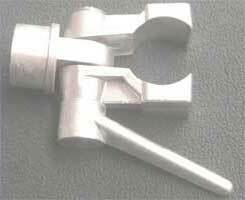 In the die casting operation a multitude of dies are available for various end uses from climbing equipment (scaffold and ladders) through to building accessories. New dies can be cut according to customer requirements. In general maximum casting dimensions available are 320mm x 320mm x 220mm with multiple core pulling facilities up to 75mm.